Each month, P.J. over at a 'lilhoohaa hosts a photo blogging challenge. This month's prompt was bridges. Now, I couldn't afford a plane trip to L.A. in order to hunt down Lloyd, Beau or Jeff so I had to make do with some local talent. With rivers, canals and highways, the Ottawa area has plenty of bridges. Back in Ottawa the Pretoria Bridge crosses the Rideau Canal. It's a lift bridge and stops traffic every time a boat large enough has to float beneath it. And finally, one of my favourite local bridges is the Royal Alexandra Interprovincial Bridge which joins downtown Ottawa to Hull, Quebec over the Ottawa River. The structure was built by Canadian Pacific Railways in 1900 and back in the day this bridge had train tracks down the centre with traffic on each side. Now the oncoming traffic runs down the centre and a pedestrian lane is over on the far left. Click on P.J. 's link up there and check out the work of the other photographers. I'm trying to understand the need for covered bridges. It can't be to keep you dry in the rain. I've read two posts on this theme and both have included covered bridges. 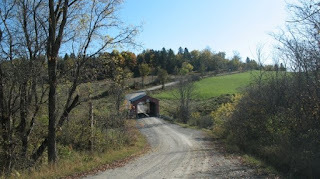 Because covered bridges were made of wood they had roofs in order to protect the wood. That's largely why they were covered. How about that, eh? It looks almost castle-like doesn't it. I couldn't find any information on the architecture unfortunately. Now I get it. I don't know of any wooden bridges in the UK, but who knows? I noticed the question, "why covered bridges." Back before roads were paved the bridge was covered to keep the road across the water from being worn away by the rain. Ky. has a few left but at one time they were everywhere. I like your of the covered one. The Pretoria bridge looks very similar to a couple of shots I took of the bridge at Diesenhoffen in Switzerland at the start of the month. I have to wonder if our oldest GeoKid will see any of these bridges. He's in Ottawa for a month-long STEM and entrepreneurship program. Then again, he'll probably be too busy to have much time to go sightseeing. Switzerland, of all places. Interesting. Yeah, exactly. I think the oldest ones are in New England. The name is after Pretoria street onto which the bridge used to run. The name was controversial at the time, referring to the British victory at Pretoria in the Boer War. Why thank you, Mike. Coming from you that's high praise, indeed. We live in a wonderful area of the country. I have got to go find some covered bridges! As someone who is TERRIFIED of bridges, these look rather lovely. Except for that Royal Alexandra Interprovincial Bridge. NO THANK YOU! I looked it up. It's called gephyrophobia. Depending on where you live and the bridge involved you can actually get people to drive you across the bridge. Imagine that. Wikipedia lists four: Birkenhead Park, Logic Lane, Bridge of Sighs, Oxford and Bridge of Sighs, Cambridge. No wooden bridges, though. Yhey're all made os stone it appears like the Birkenhead Park structure pictured. You see the lengths I go to for you Babs. I do have vague memories, as a kid, of walking across little wooden foot bridges in parks though. They woodn't (notice that?) be classed as bridges though. Really? I need that service! The Royal Alexandra Interprovincial Bridge looks alot like our Victoria Bridge, except we still have the train down the center and the cars still drive on the metal section. It's especially fun in the winter. Also, I didn't know about any covered bridges in the area. Nice shots, Dufus. I really like the perspective of the fifth shot. Those first three are charming! Great finds...better than LA! Another interesting thing about the Interprovincial bridge is that it has the National Art Gallery on the Ontario side and the National Museum of Civilization on the Quebec side (which you can just see on the right sode of the bridge). You can actually walk from one to the other. Thanks, Lisa. The first two are from the surrounding countryside. The third is in the city. Ottawa and area can be very beautiful. Excellent work, dufus! 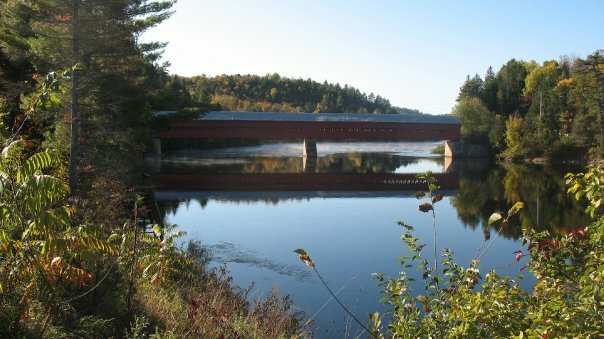 I haven't yet had the chance to visit covered bridges in Quebec, but I've seen a bunch I'd like to see one day. A road trip through the province is one I'd like to take and see the photos, among other things! If you plan on a road trip through Quebec give me a call. My goodness, Dufus, had I known Canada was this beautiful, I would've skipped the US and come visit you instead.